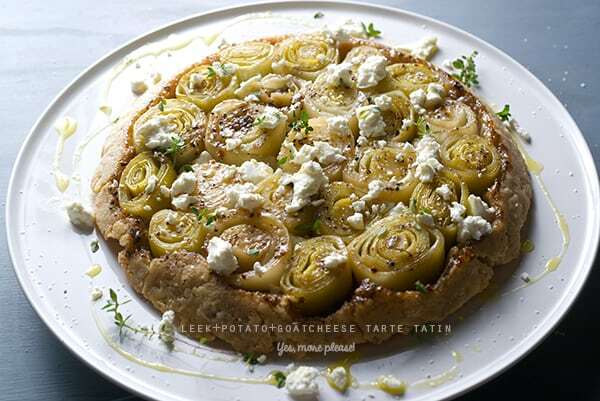 What is a Tarte tatin anyway?.. Basically its an upside down pie. Why would you want to make an upside down pie?..In a word, caramelization. 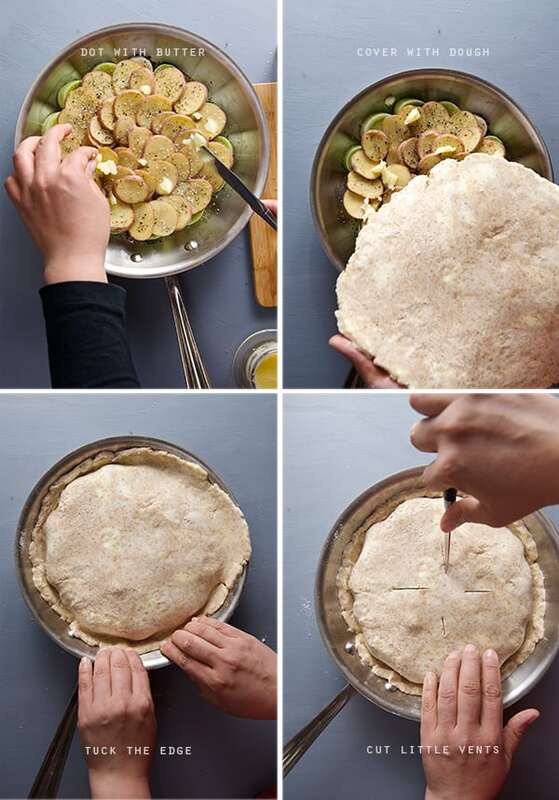 It’s not only the easiest pie-tart you will make, it’s also one of the tastiest. 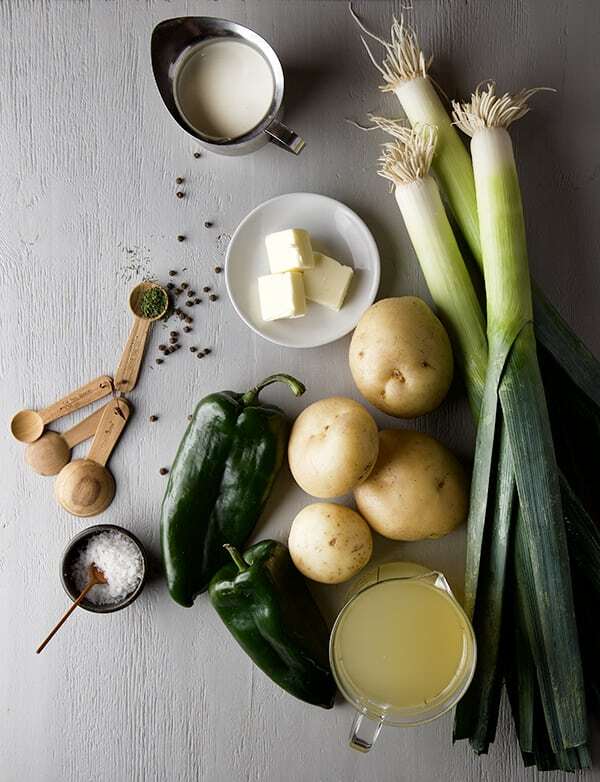 Leeks, green onions, and potatoes are in season. 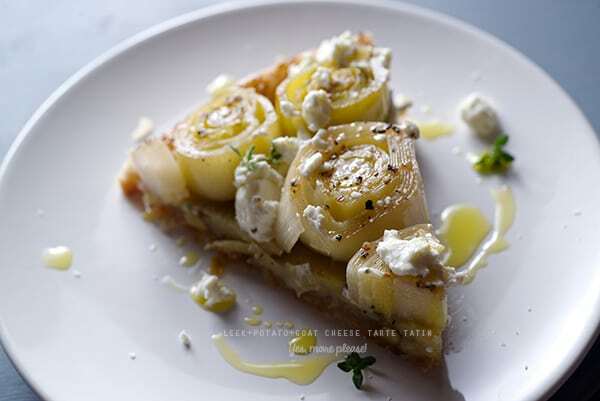 Inspired by the classic of classics Vichyssoise soup, I gave my little spin using the same ingredients I transformed them in to a leek and potato tarte tine that it tastes equally delicious warm or at room temperature. I used a mix of whole wheat and white flour, to give the crust a nutty flavor and added some thyme, to flavor the crust. Super easy to prepare. 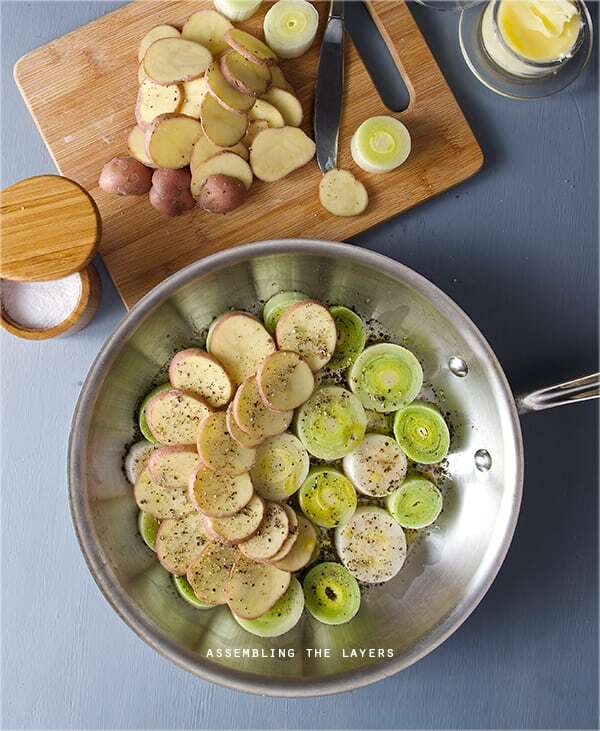 The flavors of the leeks, and potatoes shine together,the leeks mellow out the onion flavor and became buttery complementing the potatoes. 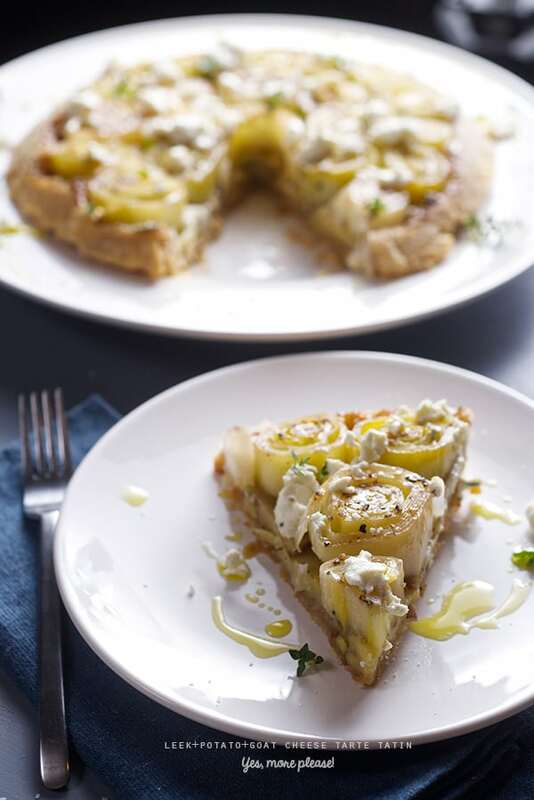 the little addition of honey adds a little sweet note, fresh cracked pepper , salt and butter is all this tart needs. 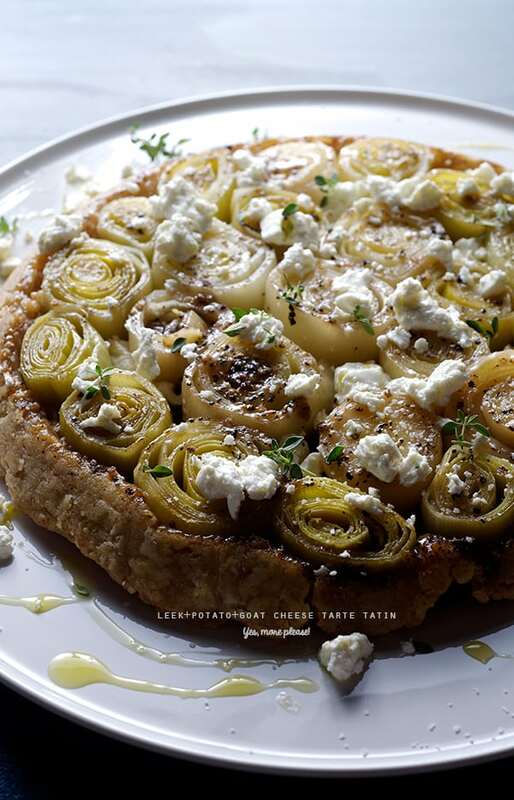 Top it all off with the king of fresh cheeses: goat cheese and a little drizzle of extra virgin olive oil. I made it for dinner with a great green salad and orange slices on the side… The next day we had leftovers for breakfast with a sunny side up egg on the side… Choose your weapon, this is a killer recipe..enjoy! 3-4 Leeks upon diameter and length. 4- 6 Small red potatoes or yellow wax potatoes thinly sliced. Leeks are bulbs like onions, the part we are eating is the bulb that is under the soil and believe it on not, this is the cleanest. The part of the plant that sprouts out of the soil that’s were the trouble is. That’s where all the sand sneaks in and there is nothing worse than when you are eating a leek, than to crunch those little particles of sand. Until I understood the anatomy of this vegetable, I couldn’t make sense of how to clean it. Infinite inner layers, like an onion in a tube form is where the sand goes. Depending on how are you cut them there are different washing methods. The parts that are closer to the leafy greens are the ones that needed the most care and to wash the rest are fine. I just submerge the greenest slices and press a little under the running water. I slice them and place them in paper towels that absorb the extra water. Once this procedure is out of your way the fun part begins. Preparing the dough! 1 stick = 4 oz unsalted butter, cold and cut into small squares. Measure all your ingredients, and place all the dry ingredients in a bowl and mix. Place bowl in the freezer. Meantime cut your cold butter, and iced water ready to measure. 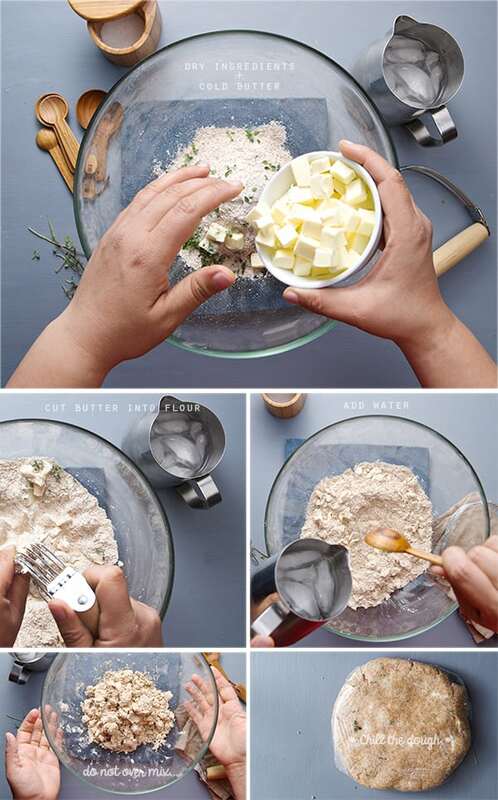 Remove the bowl of dry ingredients from freezer and add the butter. Add the thyme. With a pastry Blender incorporate the butter and flour until the mixture resembles to a coarse meal, and the butter pieces are small like the size of a pea. Slowly add the cold water and carefully with your hands form a dough that just holds together. Do not over work the dough. Once that the dough barely holds together cut a piece of plastic wrap and place your dough. Wrap it and shape it into a disk. Refrigerate for at least 1 hour or 15-20 minutes on the freezer. If you plan ahead you can make the dough the night before. 1. In a 9-10” skillet with rounded edges, melt 4 tablespoons of butter, add a glug of extra virgin olive oil, drizzle the honey, sprinkle the sea salt and freshly ground pepper. 2. 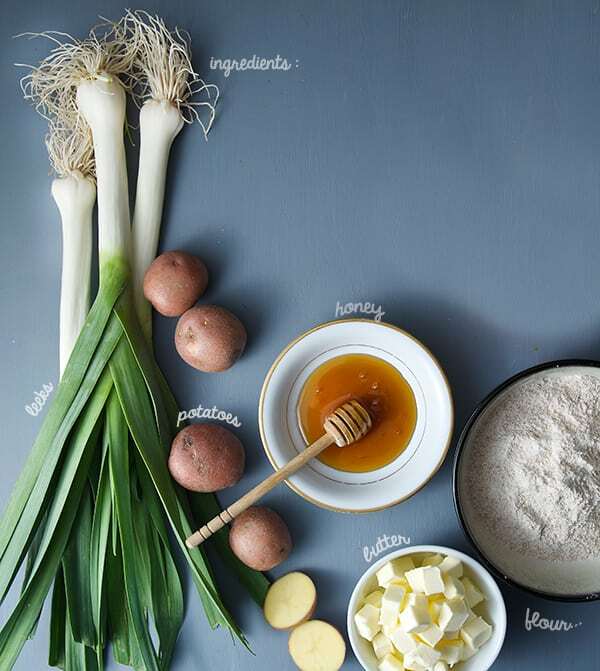 Place an even and tight layer of leeks, and top this with a layer of the thinly slices of potato. 3. 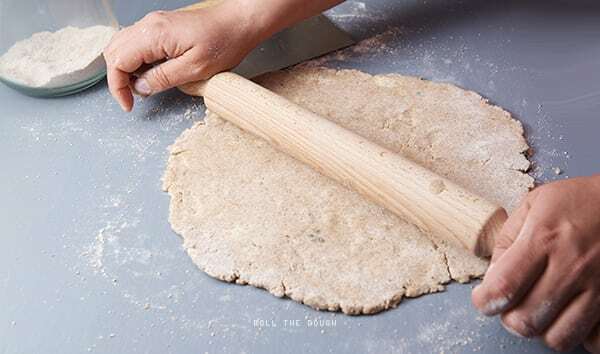 Once your dough is chilled, roll it out into a 10” circle 1/4” inch thick. 5. With a small pairing knife make 4 incisions. Bake at 425F/ 220C for about 25-30 minutes on the first 1/3 of the oven rack. until the top is golden brown. 6. Remove from the oven, and cool the tarte tine for about 10-15 minutes. 7. 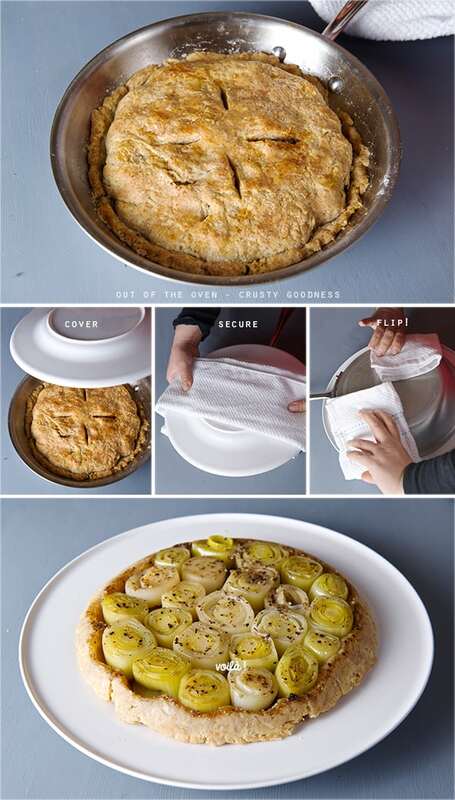 With the help of a round plater, cover the skillet and wrap it with a kitchen towel. Flip. Sprinkle some kosher salt, pepper, drizzle some extra virgin olive oil, and fresh thyme.